This beauty ritual and technique is being seen everywhere on the beauty circuit. Jade Rolling is good for increasing circulation, draining the lymphatic system and reducing puffiness and also reducing the appearance of fine lines. 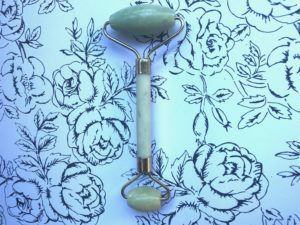 Jade Rolling is using the beautiful stone of jade, as a facial massage tool to help our face and skin to age gracefully (anti-aging), balance our energy and make the skin appear more supple and radiant and help with inflammation. The energy of the stone Jade is associated with prosperity and abundance and good energy and reducing negative energy. This also has also the energy of wealth and longevity. This connects you with your heart chakra and the universal energies of the earth and water. This also reduces stress and promotes relaxation. 1. Make sure to cleanse your roller with warm light, soapy water. Then lightly dry with a warm micro-fiber cloth or let air dry. 2. Use an oil: Almond or avocado ( dry skin), jojoba (Normal to oily skin), sunflower(oily, inflamed skin) or coconut oil ( normal). Pick one of these listed in accordance to your skin type. You can also use your favorite skin serum too! Rub the oil all over the face in an upward motion. Use about a dime size to start and be careful around the delicate eye area. 3. Take the jade roller, start from the center of the face, under the eyes and gently roll up under the eye and outward towards the temple. Gentle motions. You may want to use the smaller size end under the eyes. Then keep rolling starting from the center of the face, upward and outward. Use the bigger part for the bigger sections of the face. Always move upward…to keep skin from sagging:). We want to fight gravity and help gently circulate upward with the tool. Then move to the forehead and just roll it upward in the center and move to the left and to the right, outward and towards temples. This should take about 3 minutes. Voila! You are done! Very simple! You can do this in the am or pm as a nice ritual! It may even be nice to add music! So relaxing and your skin feels luxurious! I did this and it def felt really nice and you have to be consistent to see results. This is definitely something that won’t be noticeable overnight. It’s taking the time for yourself and praticing self-care. I need to add this to my professional makeup/ set bag to use on set! Good to note! Thanks for reading! Hope you enjoyed!